Map of Austria-Hungary in 1914. The itinerary of Jaroslav Šerák took place entirely within the borders of the Dual Monarchy. The Fateful Adventures of the Good Soldier Švejk is a novel which contains a wealth of geographical references - either directly through the plot, in dialogues or in the authors own observations. HAJ: was himself unusually well travelled and had a photographic memory of geographical (and other) details. It is evident that he put great emphasis on this: 8 of the 27 chapter headlines in Švejk contain place names. This web page will in due course contain a full overview of all the geographical references in the novel; from Prague in the introduction to Klimontów in the unfinished Book Four. Countries, cities, towns, villages, mountains, oceans, lakes, rivers, islands, buildings are included. Note that from 14 September 2013, institutions (including pubs) have been moved to the new 'Institutions' page. The list is sorted according to the order in which the names appear through the novel. The chapter headlines are from Zenny K. Sadlon's recent translation and will in most cases differ from Cecil Parrott's version from 1973. The names are coloured according to their role in the novel, illustrated by these examples: Sanok as a location where the plot takes place, Dubno mentioned in the narrative, Zagreb as part of a dialogue, and Pakoměřice as mentioned in an anecdote. Příčná ulice is mentioned by Mrs Palivcová who could tell Švejk that an upholsterer from there was the only one who had latched on to Bretschneider's bait since Švejk's and Palivec's arrest. The street later appears in the anecdote about the bookbinder Božetěch in [IV.1]. Příčná ulice is a very short street Nové Město slightly east of Karlovo náměstí. It connects Žitna ulice and Navrátilova ulice (then Hopfenstockova ulice). 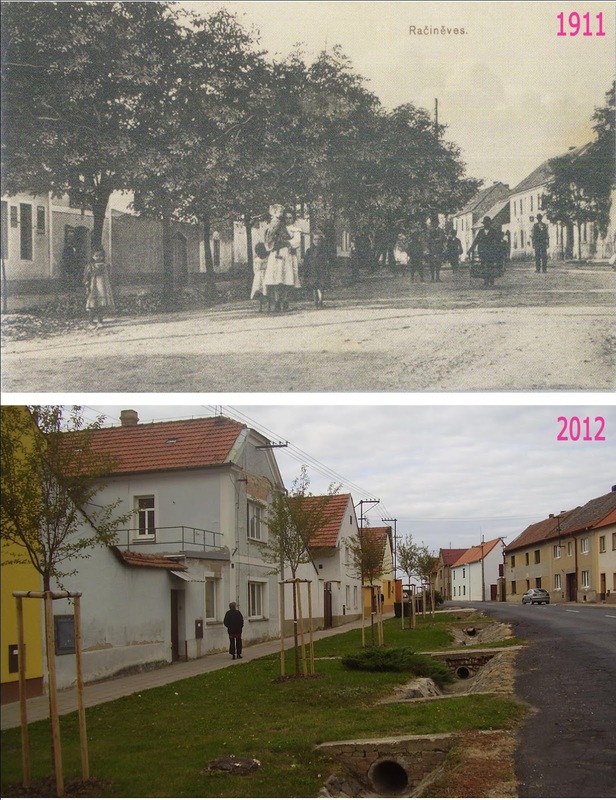 According to the address book from 1910 there was no upholsterer in this street, the closest were a few in Žitná ulice. [1.6] Za tu celou dobu dostal na lep jen čalouníka z Příčné ulice. Račiněves is briefly mentioned in an advert Švejk reads aloud at U kalicha to divert Bretschneider's attention. See Straškov. Račiněves is a village by Roudnice nad Labem, 47 km north of Prague. In 1913 the place counted 840 heads, all Czechs. It was part of okres and hejtmanství Roudnice, and as correctly pointed out in the novel it had a school and a railway station. Straškov is briefly mentioned in an advert from a certain Čimpera that Švejk reads aloud at U kalicha in order to distract Bretschneider. See Račiněves. Straškov is a village by Roudnice nad Labem, 47 km north of Prague. The nearby mountain Říp is according to legend the first place in Bohemia where arriving Czechs settled. In 1913 the place counted 509 heads, all Czechs. 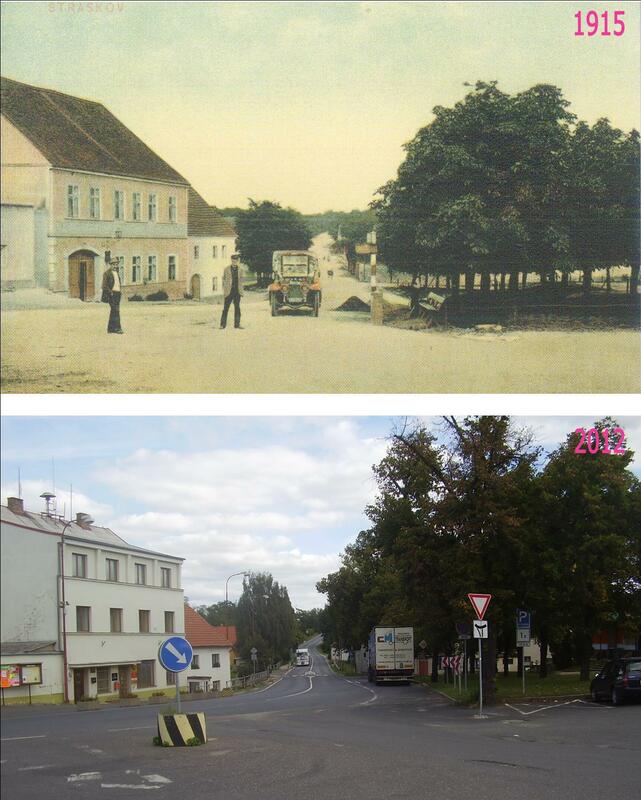 It was part of okres and hejtmanství Roudnice, and as correctly pointed out in the novel the post office was in Račiněves (and it indeed had a railway station). Dejvice appears when Švejk tells Bretschneider that he is aware of a toothless dog there which he can provide him with. Dejvice is an urban area and cadastral district in western Prague between the centre and the airport. It is administratively part of Prague 6, and is regarded as one of the more exclusive parts of the capital. The district became part of Prague in 1922 and Vítězné náměstí is regarded its focal point. In 1913 Dejvice was still a separate entity, although it was part of the Prague conurbation. It belonged to hejtmanství and okres Smíchov. The population counted 6,582 of which all but 268 were Czechs. Great St Bernard Pass is mentioned indirectly through the dog breed St Bernard (or Bernardiner) that has its name from the well known mountain pass in the Alps. The dog breed first appears in [I.6] when Švejk avoids Bretschneider's attempts to trick him into compromising himself. This he duly achieves by giving totally off-topic responses, in this case a story about a Bernardiner puppet. In the same chapter Müllerová reveals that she had a visit from the police when Švejk sat arrested and a Bernardiner bit a policeman before it ran away. Later in the novel the dog breed appears several times, included in [I.14] during a conversation with Lukáš and also during the preparation of the dog theft. Factory owner Vydra owned a Bernardiner that Blahník stole. Great St Bernard Pass is a mountain pass in the western Alps that has given name to the mentioned dog bread. The highest point is 2,469 metres above sea level and the pass connects Switzerland and Italy. It is named after Bernard of Aosta, better known as Saint Bernhard. The St.Bernhard dogs are considered the largest of all dog breeds and may weight up to one hundred kilo and reach a height of one metre. It was originally bred by the sanctuary at Great St Bernard Pass and used for rescue duties in the mountains. One hundred years ago the dogs were much smaller than today, but because of the increased weight they are not longer suitable as avalanche- and rescue dogs. Václav Menger, "Jaroslav Hašek doma"
At the time when Jaroslav Hašek edited the magazine Švět zvířat (Animal World), the St Bernard dog appeared repeatedly on its pages, in text and photos. Further Václav Menger writes that Hašek once wrote an invented story about such a dog in České slovo, much to the annoyance of the dog's owner, the hotel proprietor Karel Černý from Černošice. The latter even appeared in the editorial offices in an agitated mood, with his enormous dog on a lead! [1.6] Švejk prohlásil, že neměl se státem co dělat, ale že jednou měl na ošetřování slabé štěně bernardýna, které krmil vojenskými suchary, a že také chcíplo. Brno is mentioned by Müllerová when she tells Švejk about the police interrogation after the latter had been arrested by Bretschneider. She was asked by the police if she had received money from abroad, and she said: "Yes, from Brno". The city is mentioned only once more, in connection with field chaplain Matyáš who died there without having paid off his debts. Brno is the second largest city of the Czech Republic with a population population count of around 380,000. The city has a strong industrial tradition is also seat of the country's most important legal institutions. In 1914 Brno was the capital of Moravia, but the city was much smaller than today, also in area. At the time a majoriy of the 123,000 inhabitants was German (this number also includes the 15,000 Jews). Jaroslav Hašek visited Brno in 1902 on his way back from Slovakia. He wrote a post-card from here, addressed to his cousin Marie who at the time lived in Jaroměř. The card is also signed by Viktor Janota and Jan Čulen. [1.6] Se mnou také dělali výslech, kdo k nám chodí, jestli nedostáváme nějaké peníze z ciziny, a potom dělali narážky, že jsem hloupá, když jsem jim řekla, že peníze z ciziny chodějí jen zřídka, posledně od toho pana řídícího z Brna ta záloha šedesát korun na angorskou kočku, kterou jste inseroval v Národní politice a místo toho jste mu poslal v bedničce od datlí to slepé štěňátko foxteriéra. Angora is here used as an adjective to denote a breed of cats, Angora. The cat race is mentioned several times in the novel. It first appears when Müllerová tells Švejk that she told the police that he had received for cat that he had advertised in Národní politika. The money were from "abroad", from a businessman in Brno. The second cat [1.14] belonged to senior lieutenant Lukáš and takes part in the plot directly. It devours his canary bird after Švejk had the idea to let the cat and the bird together "to get used to each other". The cat soon after ended its life by eating shoe polish [I.15]. Angora is the historical name of Ankara, the capital of Turkey. Ankara is the second largest city in the country and has been capital since 1923. The Angora cat is a breed of domestic cats originating from central Asia Minor. Pictures of Angora-cats appeared on the pages of the animal magazine Svět zvírat during the time Jaroslav Hašek edited the periodical (1909-1910). At the same time he wrote a story about the Angora tomcat Bobeš, a cat that could talk. The story's title was O domýšlivém kocouru Bobešovi (About the vain tomcat Bobeš) and was printed in Svět zvířat on 1 March 1910. The Angora Cat also appears in altogether six (or more) pre-war stories. One of them is Má drahá přitelkyně Julča (My dear friend Julie) that was printed in three issues of Zlatá Praha in April/May 1915. This story is also set during Hašek's time as animal trader at Košíře and contains themes known from the novel (Brehm and Klamovka are mentioned). The story O nejošklivějším psu Balabánovi (Svět zvířat, 1913) also contains a reference to an Angora cat. Another talking cat Markus features in another story, there is also a cat Lili in the story about Axamit. See links below for a full list. [1.14.3] Neobyčejně rád měl zvířata. Měl harckého kanárka, angorskou kočku a stájového pinče. [1.14.3] A angorská kočka si opět vlezla pod pohovku. Leonberg is mentioned indirectly through the dog breed Leonberger when Švejk tells Bretschneider that he once sold a Leonberger to an anarchist. for 100 crowns. Leonberg is a town in Swabia that gave its name to the mentioned do breed. This is a very large and fury dog breed, that appeared through breeding in 19th century. It can weigh up to 80 kilos. Leonberger-dogs are written about in Svět zvířat at the time when Jaroslav Hašek was editor of this weekly. The author had good knowledge of dog-breeding, something that is reflected in the many references to dogs throughout the novel and otherwise in his literary output. [1.6] Když měli každý pátou čtvrtku, prohlásil se Bretschneider za anarchistu a ptal se Švejka, do které organisace se má dát zapsat. Švejk řekl, že si jednou jeden anarchista koupil od něho leonbergera za sto korun a že mu zůstal poslední splátku dlužen. Scotland is mentioned indirectly through the dog breed Scottish sheepdog when the author describes Švejk's dog deals with detective Kalous. Scotland is a nation occupying the nortern part of the island Great Britain that since 1707 has been in a union with England. As a member of the United Kingdom, Scottish forces took part fully in the first world war. The Scottish sheepdog (border collie) was mentioned in the late 19th century. It is regarded the worlds most popular shepherds dog. [1.6] Pak tam šel koupit psa detektiv Kalous a vrátil se s vyjevenou potvorou, připomínající hyenu skvrnitou, s hřívou skotského ovčáka, a v položkách tajného fondu přibyla nová: D...90 K.